Senior Warlpiri Law custodian Lorna Fencer Napurrula began painting in 1986 with a small group of women who produced collectively, the first women’s paintings from Lajamanu for the Warnayaka art centre. Having collected from the male artists of this community in that year, Judith Ryan acquired a collection of works from these authoritative older women for the National Gallery of Victoria’s ‘Paint Up Big’ exhibition and published a catalogue which documents this collection. Lorna was born near the Granites Mine area of the Tanami Desert around 1925 but grew up in Yuendumu. In 1949 many Warlpiri, including Lorna, were forcibly transported to the government settlement of Lajamanu situated in Gurindji country 250 miles to the north. Lorna was an exuberant, larger than life character, a trickster during important women’s ceremonies. Her artworks are celebrations in pure painting. Exuberant in gesture, they feature spontaneous impulsive designs. She preferred to create explosive linear works rather than the more familiar Warlpiri symmetrical dotted designs. Yet at her best, her painting, though expressed randomly, contains a symmetrical logic with design elements emanating lyrically from a central core design. She adored colour especially yellow and bright reds. ‘Orangy Ornagy’ she would demand of any paint assistant nearby, as she worked furiously with utter self-assuredness. Employing bright yellows, lime greens, pink and purple, her paintings resemble instantaneous floral bursts and impress in terms of what Judith Ryan has referred to as ‘essays in pure colour’. 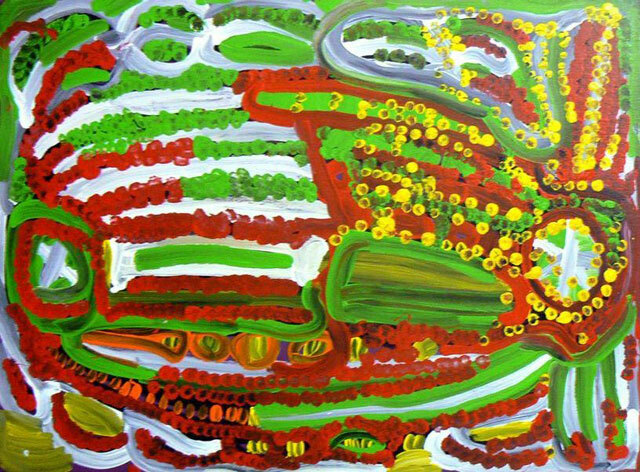 While the market tended to favour the ‘Op Art’ aesthetics seen in much Aboriginal art of the late 1990’s, Lorna Fencers work invited a ‘Pop Art’ comparison with its spontaneous vitality and freshness characterizing the dominant aesthetic. The work illustrated here was created in September 2004. It measures 99 x 148 cm. and is typical of her bush potato works. The lines in the painting depict the root system and the branches of the plant. The circle represents the hole, where the women dig to find the bush potatoes. Lorna was an artist ‘driven to paint’ and it was indeed unfortunate that Lajamanu was so badly served by the art establishment during her most productive period as a painter. The art centre lapsed in to decline for want of funding and Lorna painted increasingly in Katherine. While she held several solo exhibitions, most notably at Alcaston House Gallery in Melbourne and Coo-ee Aboriginal Art in Sydney, she was supported on a regular basis by Katherine Art Gallery and in the year prior to her death, by Mimi Arts and Crafts. Many of her finest late career works were produced for Japingka Gallery in Fremantle. The list of collections that hold her works is very impressive indeed. They include Artbank, the Gantner Myer, Holmes A Court, Kerry Stokes, Margaret Carnegie, Laverty, and Leewuin Estate collections as well as several other state and private collections in Australia and overseas. Nevertheless her secondary market record is underwhelming. Of the 83 works offered only 28 have sold with the average price of her sold works being just $3,828. The highest price achieved at auction was for a painting with Alcaston House provenance, measuring 179 x 183 cm, which sold at Christies in August 2005 (Lot 152) for $11,352. Several others have achieved in excess of $7,000 but overall, her secondary market record does not make for entertaining analysis. Perhaps the fact that she was so terribly prolific in her final years and spread her paintings as widely as the seed of her beloved yam, always in the hope that some would fall on fertile ground, mitigated against her sales at auction. While this may change in time it may be that the horse has bolted. This is one artist whose work is deserving of a thorough reappraisal, as she was undeniably a one-off original. One hell of a joyous fun loving exuberant ‘Wild Warlpiri Woman’.